The NOTIFIER ID60 Series Single Loop intelligent fire alarm panel, has been developed for both installers and end users with efficiency in mind, offering a technically advanced range of facilities and functions while remaining easy to install, program and operate. Three models are available in the ID60 series. The compact ID60, the ID61 with internal printer option and a larger separate power supply and the ID62 with internal printer option, a larger separate power supply and added space for 72 hours battery back-up. 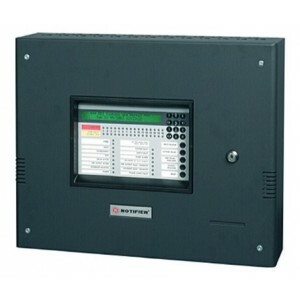 The ID60 series supports NOTIFIER’s unique Very Intelligent Early Warning (VIEW™) technology. Combined with the patented AWACS™ (Advance Warning Addressable Combustion Sensing) and DIG (Dynamic Intelligent Grouping) algorithms, the ID60 series provides the most cost-effective, stable and reliable early warning systems without the need to use costly aspirating detection systems. The ID61 is housed in a slightly larger enclosure (500mm x 400mm x 110mm) than the ID60 to accommodate for an internal mounted printer. A larger separate power supply (3A) is fitted in the ID61 to cater for the more power hungry applications.